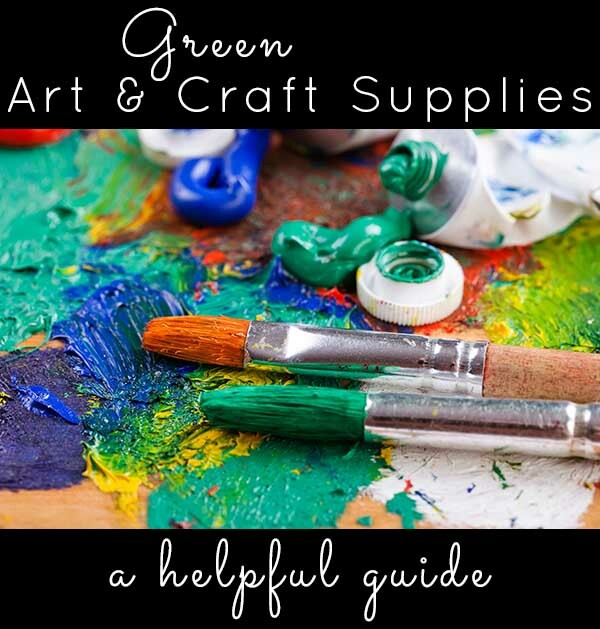 This is the Crafting a Green World guide to green art and craft supplies. We’ve got things broken out by category, and along with recommendations for supplies, we’re sharing some resources from our archives that we hope you’ll find helpful. The list below is mostly for new art and craft supplies. Of course, using what you have or choosing salvaged and second hand materials is the best choice for keeping your crafty impact low. But sometimes, you need something specific. When you do buy new, this guide is meant to help you navigate the world of new craft supplies. Organic fabrics – Conventional cotton is a human rights disaster. Clear your conscience with beautiful organic cotton or other organic fabrics instead! There are so many brands out there now, even ones that give conventional cotton a run for its money in the price department. If your local fabric store doesn’t carry organic cotton, try Etsy. I have found many sellers on there offering organic cotton, hemp and organic cotton/hemp blends in a range of designs, colors, and prices. Organic ribbon – Choose organic cotton ribbon instead of synthetic (aka: plastic) or conventional cotton. We really like May Arts organic ribbon. You can check out my review of their product here. Organic notions – We pulled together a helpful resource guide to organic sewing notions. Hemp Twine – Baker’s twine is usually made from dirty conventional cotton, but you can still do all of the cute baker’s twine crafts your heart desires. Just choose sustainable hemp twine instead! Check out our hemp twine review here. Ethical metal – From chain and findings to beads, jewelers use a lot of metal. Check out these tips for sourcing metal that doesn’t pollute water and damage ecosystems. Fair Trade beads (and beyond) – When you’re shopping for beads, look for sellers that offer Fair Trade certified beads. Fair Trade is a paid certification, and not all ethical bead sellers can afford to pony up. Happy Mango Beads is a good example. They do not have certification, but if you read their about page, you can see that they work closely with their sources to make sure they have a good impact on communities. You can also find natural and recycled glass beads, which are great options. If making vegan jewelry is your thing, check out the jewelry installment of our series Vegan Crafting Made Easy. Sustainable yarn – If you knit or crochet, choosing sustainable yarns is key. Ditch the acrylic (which is really glorified plastic) and skip the conventional cotton. Check out our guide to sustainable yarns instead. Bamboo needles/crochet hooks – Bamboo is a renewable resource, so it’s a great choice for sustainable knitting and crochet. You can even repair them if they get dinged or chewed by your dog or cat. EcoGlue – Most white glue is non-toxic, but some adhesives can give off toxic VOCs. Before you grab a bottle of glue for your next project, give EcoGlue a try. We have not tested Ecoglue on heavy duty projects, but you can see how it stacks up to other white glues here. You can also try one of our tutorials for making your own natural glue. Canson XL Drawing Pads – If you’re an artist, a blank drawing pad is a must. Don’t worry! Canson makes high-quality pads with 30% recycled paper for all of your drawing and sketching needs. Read our Canson XL Drawing Pads review! Earth Paint – Kick regular tempera paint to the curb and let your kids get creative with these natural pigments instead! Here’s our review of Earth Paint. Embellishments – Choose embellishments made from recycled or FSC Certified paper. Of course, you can also make your own embellishments. Art supplies – If you’re looking for grown-up art supplies, Fine Art Tips has a great piece with some recommendations worth checking out. Water-based spray paint – Krylon H2O was the first water-based spray paint on the scene, but there are more options available now, if you can’t find what you need from that brand. Include “water-based” when you’re searching, and you’ll turn up what’s new and exciting. Zero VOC Paint – There are a lot of options here, too. We did a review of Olympic Icon Zero VOC Paint & Primer, and there are many other zero VOC brands available at conventional hardware stores. Paint brushes and rollers – There are some good, recycled paint brushes available now, like this one. You can also find paint rollers made from recycled materials. Organic and vintage fabrics – For furniture projects, accent pillows, and any other DIY home decor involving fabric, choose organic or vintage wherever possible. Organic fabrics have come a long way, baby, and there are lots of sturdy options with fresh, modern designs. You might be surprised what a little googling will turn up! Sealants – Furniture sealants can be pretty nasty, and chances are you’re going to be choosing the least bad option here. Look for “water-based,” low VOC,” or “zero VOC” on the label. You can also make your own DIY wood polish with two ingredients. Is there something you’re looking for that isn’t in our guide yet? We are always happy to help you find what you need! Send us an email through our Contact page, and we will see how we can help!